описание: Функция быстрого вызова команд, а также их автоматическое дополнение до сих пор не реализована в среде командной строки операционных систем Windows. Возможно это не такая уже необходимая вещь для пользователей Windows, однако многие, кто использовал альтернативные системы семейства Linux, знает, как ускоряет вызов команд данная функция. Подобный недостаток решили компенсировать авторы небольшой утилиты под названием Executor. Программа представляет собой своеобразную замену стандартного диалога «Выполнить», однако предоставляет куда более широкие возможности. Она позволяет по первым буквам слова найти и автоматически дописать требуемую команду, а затем выполнить ее. Executor - is a multi purpose launcher sporting many optional customizable features and advanced setup. The program originated as I was sick of spending too much time searching for programs through my ever growing windows start-menu, and eye-balling desktop trying to mouse locate what ever I wanted to launch. Also I missed a tool that could ease and optimize my daily workflow. There was of course already programs like this available, but each had it's annoyance or missing features or too(!) geeky. * Added you can right-click items in the list for the standard windows context menu and special context menu for items that doesn't match the windows context menu. * Added you can press F9 or select "windows context menu" from the context menu to invoke the standard windows context menu for the input in the text input field. * Added a right-click menu for system-tray icon. * Added a setting named "Detect and hide duplicates". If enabled it will not list an item more than once in the drop-down/list (if for example it exist both in history and keywords). * Added support for tray-icon refreshing if explorer crashes. * Added Executor now knows how to open .cpl files if not specified. * Added a internal command named -edit.. will close down executor and open executor.ini..
* Added copy/paste/cut to right-click context menu. * Improved drag-n-drop keyword name detection. * Fixed a bug where a keyword calling multiple keywords with parameters wouldn't launch properly. * Fixed an issue with dragging a folder to keyword list. * Fixed an issue with -exit file parameter. * Fixed Executor internal work folder will remain the same. * Fixed bug with launching windowkeywords with hotkeys. Added a new skin type called alpha. This supports alpha blending and free positioning of all elements. Supports 32bit alpha channel bitmaps (same possibilities as png). Skin creation has also been simplified for this type. A guide can be found on the website. Added two alpha skins (Thanks to Dan Mendez for making them). Added one of them to the wizard. Added support for all environment varibles, and not just a few selected ones. Added more window commands (width, height, resize). Added if keyword does not use any $P* or $U* tags (in command, parameter or path) and given a parameter when executed, it will act as virtually append a $P$ to the keyword's parameter field. Added so input and button background can now be transparent against skin and don't have to be one specific color. This should make life a bit easier when creating skins (to enable in skinfile medium and alpha set transparentcontrols=1). This makes Executor capable of the same eye-candy as other popular eye-candy launchers. Added so $W$ (wait command) now support number of seconds. Example $W5$ for five seconds. Added tag $C$ that will be replaced by text from the clipboard. Added font property bold will now be saved. Can also be set in skinfiles with fontbold=1 (can be handy if input is transparent and displayed on a hard to read background). Added hidden setting nolistprogramsiconcache. If set to false (0) programs icons will be loaded and cached, meaning they will be displayed much faster but also take up more memory (on my computer like 4mb extra) and initial programs detecting will be a bit slower as icons have to be loaded (like two seconds more on my computer). Added a hidden setting called autosorteditor.. will sort keywords in editor after closing the keyword editor. Added hidden setting "fastesc" where if enabled pressing the "esc" key once will hide Executor if autohide is enabled, no matter what text is in the input field. Added hidden settings infocustomtime, customtime, dropdownfontname, dropdownfontsize. Added hidden setting notrailingspace. If enabled Executor will never append a space character to the input (will override smart keyword param. detection). Added new dll hookwinr.dll to replace wingrab.dll (for option to grab win-r). 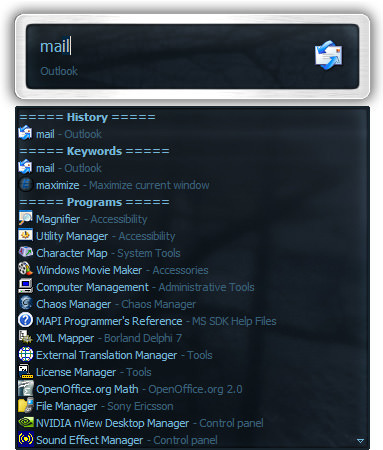 Improved popup at cursor smarter with multiscreen and taskbar. Improved launching and context-menu of some "Programs" items. Improved pressing ESC when all text is selected will hide Executor if autohide is enabled. Improved The priority setting in the settings dialog will now set process base priority, which will have a greater impact (can be confirmed in the taskmanager). Improved the two files "defaultinternet.htm" and defaultemail.eml" is no longer needed, or included with Executor. Fixed a bug in the hotkey manager. Fixed some behavior issues with multi monitor. Fixed dropdown positioning when using custom font sizes. Fixed popup at cursor when triggered by win+r. Fixed infoonfocus clock will now be properly updated. Fixed a bug where typing "\\" with certain settings could cause trouble. Fixed a bug that could in some cases trigger an access violation when using multiple monitors. Fixed $D$ working with context menu. Fixed an issue where "Programs" detection of start-menu items could follow drive/folder shortcuts outside the start-menu. Fixed various small bugs and did some performance tweaking. Fixed "&" character(s) should now display properly in title. Fixed Having a keyword where command is only $M$ or $R$ will not open default folder. Added usage license to about screen (MIT-license), installer and a license.txt file, as I often get asked about licensing. Added some more safeguarding checks to code.